Boston Acoustics A Series adds white finish and 5.1 system | What Hi-Fi? Boston Acoustics' A Series of loudspeakers is now available in a white finish, to accompany the existing black and wood models. 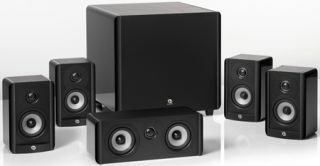 Also new from Boston Acoustics, though conversely only available in black, is the A2310HTS 5.1 home cinema system (pictured). The package, which comprises four A 23 satellite speakers, a new A 223C centre channel and the ASW 250 subwoofer, will set you back £600. It's set for release in June. The full A Series line-up, developed by Marantz Brand Ambassador and audio guru Ken Ishiwata, includes six speakers and two subwoofers – all of which are now available in white.